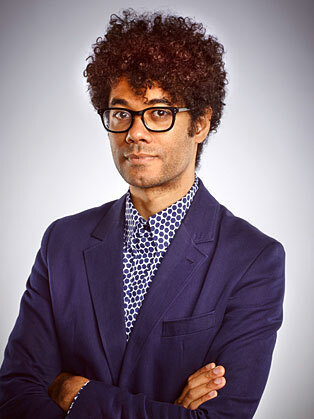 Richard Ayoade was born in Hammersmith, and grew up in Suffolk and is the son of a Norwegian mother and a Nigerian father. He studied Law at Cambridge University and became president of the Cambridge Footlights club. Ayoade’s first TV break was directing, co-writing and starring in the cult classic Garth Marenghi’s Darkplace. He has also starred in The Might Boosh and most notably The IT Crowd. Aside from acting he has directed music videos for Artic Monkeys, Kasabian and the Yeah Yeah Yeahs and has also directed the film Submarine that won the 2011 London Awards for Art and Performance. Most recently he replaced Stephen Fry as of Channel 4’s Gadget Man.